Wow! Raising kids is tough. We all know it as parents. Just when you think you mastered one skill, the next challenge comes along. It can feel frustrating, difficult and hard to maintain a positive attitude. Here are 12 positive parenting techniques to help you build a stronger connection with your children without losing your sanity. When we practice positive parenting, it helps our children to feel empowered, to understand what is expected of them and to thrive. Am I able to do this all the time? Nope! I sure wish I could but I would be a big, fat, liar if I said every time I parent it is a positive experience. I’m not even close to that level. But it is what I strive for and I am a work in progress. Thankfully, after close to 19 years of parenting I am okay with being a work in progress. Maybe it comes with age, maybe it comes with years on the job or more likely it comes from the fact that my babies are becoming adults and they are ok. In fact better than OK as far as I am concerned. They are amazing young adults. Since our youngest is only 4 years old, we have a long way to go and each day I want to be a better parent. 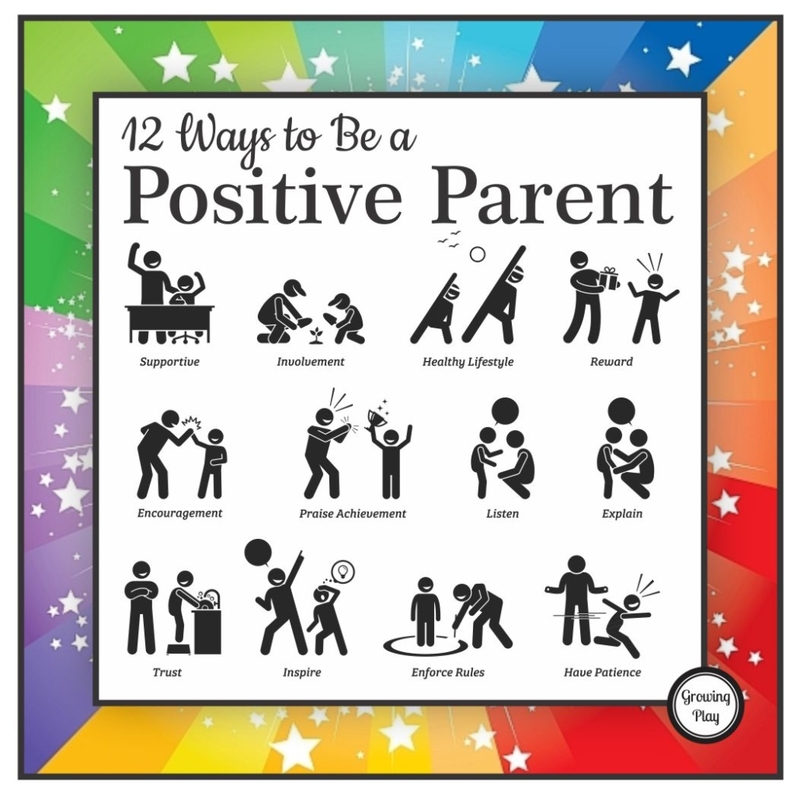 Here are 12 positive parenting techniques that I work on. This one is pretty easy for me when things are going great. Ra-ra-ra, great job, you are awesome! Not so easy for me when things take a turn for the worst. Maybe it is a bad grade, not getting along with others, etc. whatever it may be, I need to work harder at seeing what brought on the “trouble” and how I can be supportive to improve the situation. Positive Parenting Techniques #2 – Be involved. Again, this one is not too difficult for me. I am involved in my children’s lives by volunteering to coach their teams, watching them in the school play, listening the their stories, etc. Could I be more involved? I guess but I think there is a fine line on overdoing it and letting your children figure somethings out without you there. Positive Parenting Technique #3 – Be healthy. Oh boy do I need to work on this one. I am not the best role model for a healthy lifestyle. First of all, I eat a TON of candy which means so do my children. Second of all, I don’t exercise daily but I do consider myself active. Thankfully, my kids do exercise daily. It is true that healthy parents help raise healthy kids. I need to work on this one! Positive Parenting Techniques #4 – Reward them. As parents, yes we reward our children for good behavior, positive outcomes in their lives, etc. We mostly do this through verbal praise and not necessarily monetary gifts or rewards. Children should learn to do well in life because they are internally driven. That being said, children achieve this drive with an occasional reward to boost their motivation. Maybe a dinner out to celebrate good grades or a nice gesture they did for a friend. Positive Parenting Technique #5 – Be encouraging. Sometimes this one can be difficult. As children get older they can want to achieve goals that you may not be interested in. It is so important to encourage them to go for their dreams and not yours! This is especially important for teenagers. As parents, write them a small positive note or tell them often the talents that you see in them to offer encouragement. Sometimes, teens don’t see it within themselves what special talents they may have. Teens will start to realize that the talents won’t go away, and they can rely on them for the rest of their lives…as long as they cultivate them. Positive Parenting Techniques #6 – Praise acheivement. As I mentioned previously, as parents we always verbally praise achievement but we try not to overdo it. If children get used to hearing it all the time it doesn’t mean much after a while. Praise them for good effort at times, even though they might not achieve the end goal. Positive Parenting Technique #7 – Listen. You would think this one is super simple right? Just listen to your kids. Not as simple as it sounds. Children talk a lot. My brain can be on overdrive and I am pretending to listen but inside my jumbled head I am worried about who needs a ride somewhere next, did I check my work email, do we need milk, etc. Then when the kids ask “remember when I told you that?” I am clueless. They know it – they know I wasn’t truly listening and that is not a positive experience. I need to work on stopping what I am doing and truly listening to my children. Positive Parenting Techniques #8 – Explain. Children need to understand why we act the way we do as parents. Sometimes it is not good enough to say “just do it because I said to do it”. But sometimes that is good enough ie the 10th time I have asked you to take out the trash. When a child does something that needs correcting, explain to them why in a short, concise manner. Maybe give an example of why it is important not to do something or relate it to something it your own life. But keep it short and clear. This is another area I need to work on. I tend to yell my explanation or go on and on about it which is not helpful. Positive Parenting Technique #9 – Trust. As parents, we have to be able to trust our children. This gives them some freedom to have free will and make decisions. We have to trust that they will try and make the right decision and if they do not, then they will come back to us to ask for help. This is another tough one for me. I tend to micromanage my children’s lives which does not help them gain full independence. Partially I have to do this to manage raising 6 kids – we can’t be in 6 places at once but sometimes I need to let go and trust in them (and God) that they will be safe. Work in progress for sure! Positive Parenting Technique #10 – Inspire. Parents need to inspire their children to do more, to try hard and to set goals. When parents are good role models children are inspired by them. Sometimes as parents we can direct our children to other role models to help inspire them as well. In what ways do you inspire your children? Positive Parenting Technique #11 – Enforce rules. Children need reasonable rules and they need to know that there are boundaries. It provides them with a safe environment to practice their life skills. This part of positive parenting is so difficult at times for me. For example, I have a set of rules for the children to do household chores such as taking out the trash, feeding the dog, and cleaning the bathroom. They are always supposed to do their jobs before the television goes on. I am really bad at enforcing it so they get away with not doing it all the time. Then when I go to enforce the rules, I am usually angry and they are confused since the day before I let it go. Makes sense why they are confused for sure. My husband is much better at setting and enforcing rules than I am. When he says it is a rule, the kids know it and follow it. There is no grey area. Are you a rule enforcer? Positive Parenting Techniques #12 – Have patience. Ugh, of course the last technique is the hardest. Patience is difficult to have with kids day after day. It is so important to remember that children are only children once. They have ONE chance to grow up. Be patient. They make mistakes, we make mistakes as parents. Be patient with ourselves and with the children. When we are quick to snap, yell, or get frustrated remember they are only young once and they grow up so quickly. Step back, reassess the situation and realize that most likely things could be much worse. Slow down, be patient and let the situation unfold. For sure, stepping back and taking a breather translates to a decrease in “mom guilt” for me at the end of the day. 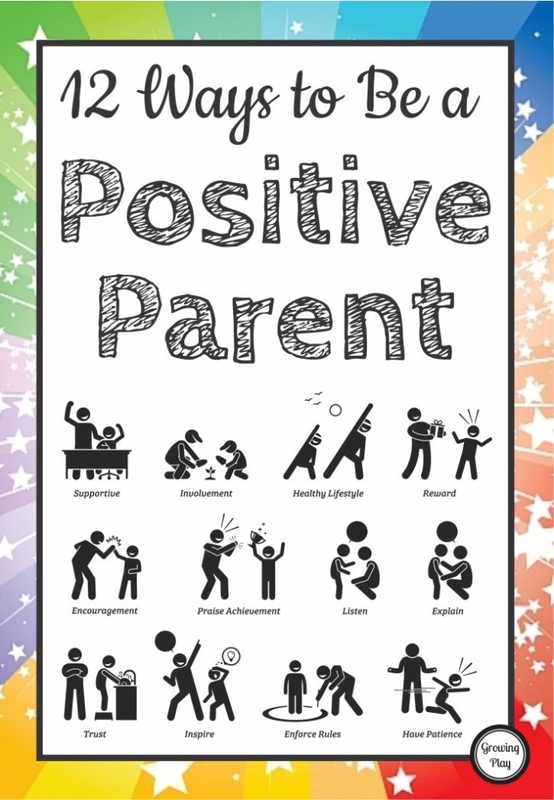 Take the time to work on these positive parenting techniques throughout the day with your children. You won’t regret it. As parents, you will feel less stress and your children will thrive. Is it easy? No way! But remember parents are a work in progress just like children. There is always a fresh start each day. The Stay Positive Encouragement Cards include 25 uplifting messages to spread kindness and positivity. Each card is the size of a business card (3.5″ x 2″). The front is high gloss and the back of the card is matte so you can write a heartfelt note. Send a note that says “You are a star” or “Believe in Yourself”. Your child can tuck the small card in his/her pocket as a reminder that they can accomplish their dreams and people are rooting for them! In today’s fast-paced society, family time is sparse. Parents spend hours at work or busy at home, followed by running children to different activities. Day after day of this, year after year, can make you feel like you are in a rut. Families need to slow down and realize that there is much to be grateful for every day of our rich and blessed existence. Participate in the Family Gratitude Challenge, so that even the most ordinary moments can fill us with rapture if we take the time to acknowledge the profound in the mundane, the small miracles all around us that can slip by in a blink if we forget to notice them. Complete with your family promoting the joyful reflection on the gift of life.